Credit: Supplied: City Yield licensed under . Credit: Supplied: Japan Property Central, Tokyo Kantei licensed under . Japan Property Central and Tokyo Kantei's data reveals a 0.6% drop from the previous months' results, but a 6% increase on last year. 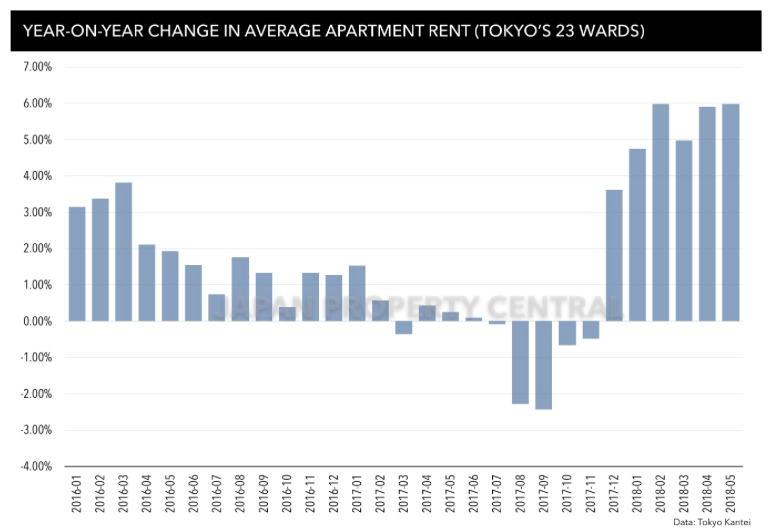 Japan Property Cental's commentary on Tokyo Kantei's most recent rental data indicates that in May 2018, the average monthly rent of a condominium in Tokyo's 23 wards was JPY3,496 per square metre (sqm). These results also show that average apartment size is 55.79 sqm and average building age is 18.5 years. Nishi Shinjuku condominiums for rent. This data reveals a 0.6% drop from the previous months' results, but a 6% increase on last year. According to Japan Property Central, this is the sixth month in a row to show a year-on-year (YoY) increase. The study indicated that Yokohama City (-0.1%) and Kobe City (-1.5%) have both seen average rents fall from last year, while Nagoya City saw a YoY average increase of 15.2%. With the January - March peak rental season, ending Japan Property Central notes that landlords of empty apartments have begun reducing rates in an effort to attract tenants during the off-season.